Formed in 2000 by saxist/flautist Theo Travis to fulfil 2 ideas simultaneously. One was to have a collaborative Anglo/German band inc. a drummer from Hamburg that Theo plays with over there. The other was to have a band together with me. Theo had always wanted to be in a band using vibes so that he could use the combination of flute & vibes. We’d often talked about doing something together & although for years on & off we’ve guested in each others bands we’d never recorded together. In June 2000 the band did a tour under the name of Theo Travis’ Berlin Vibe which was not only a great success but also lead to us being offered the chance to record an album for Symbol Records. This all happened fairly quickly & by December 2000 we were in the studio recording an album of tunes, most of which had been written by Theo & I especially for the album. 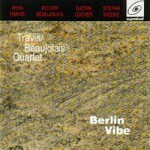 Soon after recording the album, Theo suggested we changed the name of the band to the Travis/Beaujolais Quartet. Most musicians (as well as most people) like to hog the limelight. It’s a credit to Theo that he was willing to give me equal billing. What a great guy!